The second Arizona Restaurant Week recipe is White Truffled Summer Corn Bisque with Organic Basil Essence from Tempe’s House of Tricks. 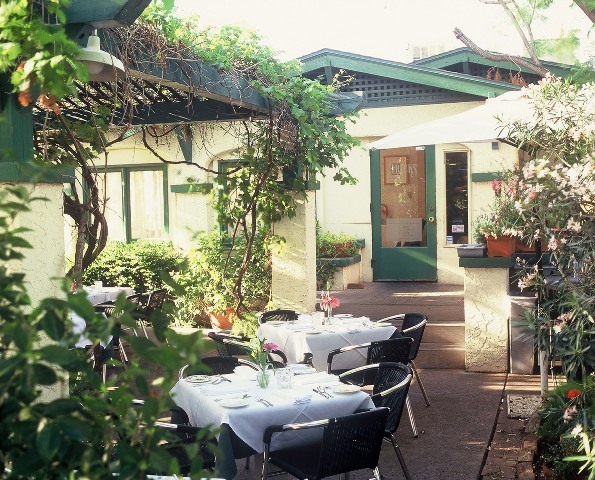 (By the way, this romantic Tempe treasure has one of the prettiest patios in the Valley. Get there during Arizona Restaurant Week and this fall for a breezy lunch.) Enjoy! In a large pot melt 3 tbsp. of butter over medium heat. Add julienned onion and whole garlic cloves. Sweat onions until translucent (about 8 minutes). Meanwhile, remove the corn from the cob with a serrated knife (it is best to do this on a kitchen towel to avoid the corn bouncing off the counter top) or use frozen corn. Add the corn and white wine to the onions and garlic and reduce the wine by half. Add the chicken stock and truffle oil and bring to a boil. Reduce heat and simmer for 8-10 minutes. Remove from heat. Scoop out the corn, onions and garlic and place into a blender. Add just enough of the stock to cover the corn. Add 1/3 of the butter and blend, adding more stock if needed to achieve the right consistency. Repeat these steps until all of the soup is blended. Then strain through a fine mesh sieve and finish with the cream, salt and white pepper. In a clean blender add basil, a pinch of salt and grape seed oil. Blend until smooth. Strain through a fine mesh sieve and place into a squeeze bottle. Drizzle over the top of the warm bisque and enjoy. I’ve never been to this place, it looks adorable. Too bad it’s all the way in Tempe. For me, soup has always been a winter thing, but thing soup may have just changed everything. For me, soup has always been a winter thing, but this soup may have just changed everything. i have always wanted to go to this restaurant, but am just never in the area. i love the name of the plkace and how the atmosphere looks. When i first moved to the valley more than 15 years ago this is the first place i went so glad to hear they are still in business! I love this place and it makes me want to go back and I will make this my next date night. Thanks and Tempe is a great town and house of tricks is a great name! That seems really easy for such an elegant soup. Definitely going to make this.